The town of Tula, 120 miles south of Moscow is known for weapons, samovars, gingerbread and Tolstoy. The city of Tula, some 120 miles south of Moscow, was once the southern outpost of medieval Muscovy. This auspicious location made it a center of weapons production, and rifles appear among Tula’s insignia, alongside gingerbread and samovars. A building directly opposite the city’s central bus station proudly boasts: “Tula has enormous importance for the republic.” It is the start of a quote by Vladimir Lenin, but few long-time residents and even fewer visitors to the city know how this quote ends: “but the people here are not our kind.” The man who called on Russia’s proletariat to rise up took a dislike to the Tula gunmakers because they were in no hurry to repair rifles for revolutionaries free of charge. The city of Tula first appears in ancient chronicles in 1146, but the exact date of its founding is unknown. In the 16th century, the city became part of the Moscow Principality and a major citadel on its borders. The walls of the Tula Kremlin, erected almost 500 years ago, have survived an endless number of fierce raids and sieges by nomadic tribes. As the fighting in the area became less frequent, Tula became increasingly known as an economic and commercial center rather than a military settlement. Today, although the city is considered eligible for federal aid, Tula boasts many impressive new housing developments and expensive cars on its roads. “This is Tula,” said Viktor, a local entrepreneur and public figure. “We are used to living extravagantly and beyond our means. It is probably our merchant origins talking.” Indeed, Tula citizens have little intention of abandoning their origins, and they take special pride in the three items that have made Tula famous far beyond its borders: arms, samovars and gingerbread. The local armory museum has assembled a unique collection of local products – from 17th century small swords to the Kalashnikov gun. Next door, the local kremlin boasts a samovar museum featuring hundreds of devices that now serve only a decorative purpose. 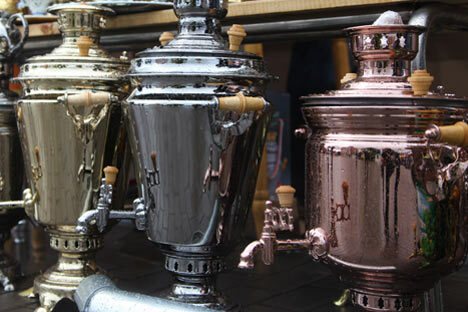 Made from copper or brass, capable of producing 26 gallons of tea or only a thimble-full, each samovar tells a story of the city – and of Russia. Although Tula residents no longer make tea in samovars, they rarely have a hot drink without gingerbread. Tula gingerbread is usually a rectangular slab with a jam filling. But give the cake a squeeze before buying – the softer it feels, the fresher and, hence, the tastier it is. But of course Tula does not live by gingerbread alone. Tula remembers and honors its great townsman – Leo Tolstoy, who spent his last years at his estate near Tula, Yasnaya Polyana. “Each Tula resident with even a shred of self-respect, at least every cultured resident, visits Yasnaya Polyana quite often,” said Sergei, a local university student. “It’s a nice place. And we very much respect Tolstoy in Tula.” The writer is still as popular around here as a rock star might be. Despite the city’s fascination with arms, gingerbread, samovars and Tolstoy, Tula is not stuck somewhere in the past. It has a wide range of restaurants, cafes and nightclubs. Teenagers on skateboards scale the facades of old mansions. The city still possesses the kind of individuality that made it so disliked by the organizer of the October Revolution. Tula state arms museum.Photos by Kirill Bychkov.